Alan Ladd was a very popular lead actor during the 1940s and 1950s. After playing in a number of detective films, he had his most iconic role in Shane in 1953. Alan Ladd was an only child, born to an English immigrant mother and a father who died when the boy was only six. Just before that however, Alan was playing with matches one day and — burnt the house down. After her husband's death, Ina and Alan moved to Oklahoma City, where she was remarried to a housepainter named Jim Beavers. Finding work became difficult for Jim, so in the mid-1920s, the family moved to Los Angeles, where he found work as a painter at the movie studios. Alan went to North Hollywood High, where he excelled at swimming and diving. Hard to imagine today, but in Ladd's senior year, he played the role of Koko in the operetta The Mikado, in 1932. This performance was seen by a talent scout who managed to get Ladd (and Tyrone Power) a contract at Universal. But after only six months, Ladd (and Power) were dropped. After graduating from high school in 1934, Ladd worked in the ad department of a local newspaper, working his way up to ad manager. When the paper's ownership changed, Ladd was canned. He tried opening a hamburger joint near the high school, but it was not a success. Ladd got a job as a grip at Warner Bros. for a couple years, but injured his back falling off of a scaffold and quit. Ladd then took some acting classes with Ben Bard, who had worked with him during the Universal contract. Bard got the shy fellow to lower his voice and project — brought him out of his shell. He married his high school sweetheart Midge, and had Alan Ladd Jr.
Ladd knocked about the studios, even getting a bit part in Pigskin Parade (which played the Chinese in November, 1936), but he didn't hit in anything until he got a gig acting on radio station KFWB. Hearing Ladd one night was agent (and former film actress) Sue Carol, who signed him up and began promoting him. Ladd's first parts under Carol was Hitler — Beast of Berlin (released in October, 1939), and Rulers of the Sea (released in December, 1939). He also got parts in Chapter 3 of The Green Hornet (released in January, 1940), The Black Cat (released in May, 1941), and The Reluctant Dragon (released in June, 1941. He also got to play a reporter at the end of Citizen Kane (released in September, 1941). By the time his divorce from Midge was final, he and Sue Carol had married in Mexico in March, 1942. Ladd performed a small role with a touching death scene in Joan of Paris (released in January, 1942). This lead to a contract at Paramount. Director Frank Tuttle wanted to try a new face to play a hitman in This Gun for Hire (released in June, 1942), and Ladd became a star from this film. Paramount wanted to continue this momentum, so they put him in the Dashiell Hammett story The Glass Key (released in October, 1942). Both of these films were so popular that Ladd got top billing (above the title, even) for Lucky Jordan (released in November, 1942). At this point, Alan Ladd's draft number was called up, and into the Army he went. Attached to the Army Air Forces Motion Picture Unit out of Walla Walla, Washington, Ladd rose to the rank of Corporal. He appeared in a war loan short film, Letter from a Friend (released in 1943). Due to stomach problems, Ladd was discharged in October, 1943. He made a few films at Paramount, including Two Years Before the Mast (not released until November, 1946), and The Blue Dahlia (released in April, 1946). By this time, Ladd was no longer elligable to rejoin the service. But he did USO shows overseas anyway. Paramount was paying Ladd a pittance in comparison with other stars, so he went on strike. When Two Years was finally released, became such a big hit that Paramount had to re-negociate their contract with the actor. In 1948, he made his first color western, Whispering Smith (released in December, 1948). 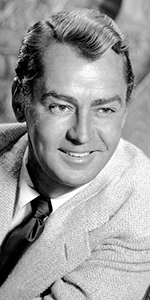 He appeared in the title role of The Great Gatsby (released in July, 1949), but it did not fare well, so Ladd went back to playing tough guys in Chicago Deadline (released in November, 1949), and Captain Carey, U.S. A. (released in February, 1950). Shane was just another picture for Ladd, which was filmed in 1951. Since director George Stevens deliberated over the editing of Shane for so long, it wasn't released until 1953 (it would play the Chinese in June, 1953), and by then, it was in widescreen and stereo. It was a huge hit. 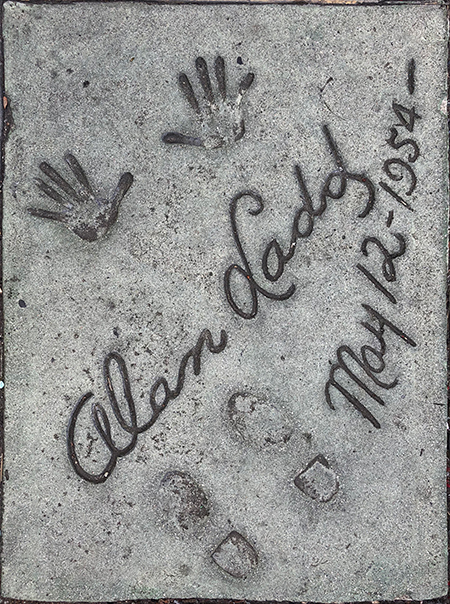 So huge that Ladd was asked to make his imprints in the Forecourt in May, 1954. By now, Ladd was branching out as both freelancer and independent producer. He made The Iron Mistress (released in November, 1952) for Warners, and Desert Legion (released in May, 1953) for Universal. He made Hell Below Zero (released in January, 1954) for Warwick Films in Britian. Ladd produced Drum Beat (released by Warner Bros in November, 1954), and did The McConnell Story (released in September, 1955) for the studio. His next production was Hell on Frisco Bay (released in December, 1955). More freelancing followed: The Big Land (released in March, 1957), Boy on a Dolphin (which played the Chinese in April, 1957), after which, Ladd signed a big contract to make films for Warner Bros.: The Deep Six (released in January, 1958), with him producing Island of Lost Women (released in May, 1959). Ladd attempted to recapture his Shane triumph with The Proud Rebel (released in May, 1958), but it didn't score; his The Badlanders (released in September, 1958), flopped. He told one and all that he wanted to quit acting in order to concentrate on producing, then, in 1962, he tried to foil an intruder breaking into his home and shot himself instead. Ladd died of an accidental overdose of both alcohol and sleeping pills in Palm Springs in January, 1946. He was only 50. After his death, Ladd had a comback of sorts by his appearing in The Carpetbaggers (which played the Chinese in June, 1964). Grauman's Chinese Theatre, Hollywood, California. Alan Ladd Forecourt ceremony, Wednesday, May 12, 1954. 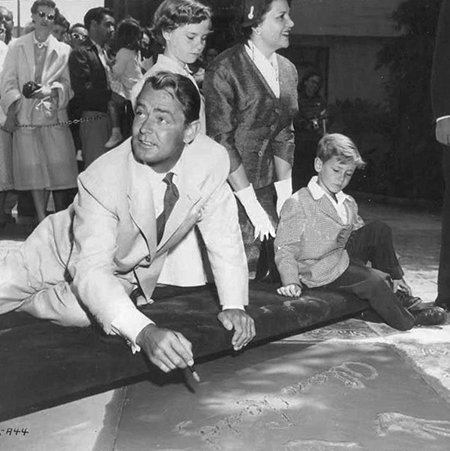 Alan LAdd makes his mark, assisted by daughter Alana, wife Sue Carol, and son David.